More than just the results of over a century’s worth of research into skin go into every tin. 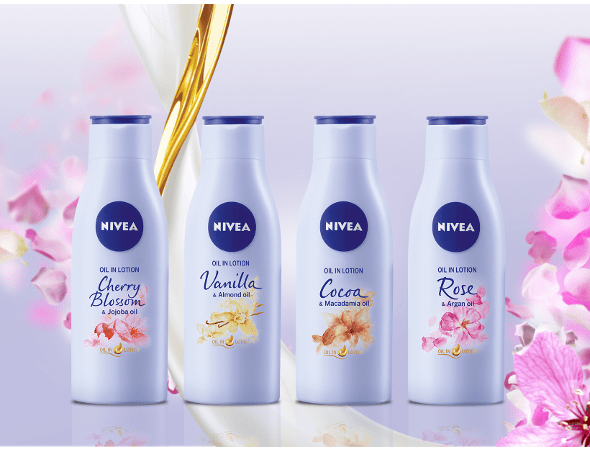 They also contain the memories of so very many people for whom NIVEA is a part of everyday life. We can still remember the days when you could find a tin in Granny’s bathroom. And remember that Mum always carried some in her handbag. The blue tin has become an integral part of life in many families across the generations – in 190 countries throughout the world in fact – and is more in demand now than ever. NIVEA Creme for daily face care. The unrivalled skin care for every all skin types. NIVEA Creme for your hands. The rich cream protects, nurtures and soothes dry and stressed hands. NIVEA Creme for your lips. Apply the cream at night before going to bed and it will nurture rough and cracked lips overnight. NIVEA Creme for red cheeks in winter. When it gets cold, the rich cream protects the skin on your cheeks. NIVEA Creme for your feet. Perfect for nurturing very dry body parts, such as elbows, knees and feet. NIVEA Creme for nail care. Apply the cream after a manicure and gently massage into your fingers and nails. The discreet fragrance of bergamot and orange, combined with lavender, rose, lilac and lily-of-the-valley, is unforgettable. In addition to Eucerit, over a hundred years ago, NIVEA Creme also contained glycerin, water, a little citric acid and its fine scent. This effective formula has been carefully adapted and improved over the decades. If you want to do something really good for yourself, then this cream is a must-have. With its firm consistency, every moisturising moment is a moment of nurturing care for your body and soul. Caresses are crucial in contributing to our feeling satisfied. They give babies a feeling of togetherness and security. If we are not caressed, we know we are lacking something. Research shows that a child’s emotional and mental development is encouraged by human contact. And applying a cream also means taking time to concentrate on yourself. Before NIVEA Creme's success story started, something else quite different had to be invented: Eucerit. Eucerit acts as an emulsifier and combines oil and water into an extremely fine, stable mixture. Fortunately, Dr Isaac Lifschütz had developed this completely new emulsifier by 1911. Dermatologist Professor Paul Gerson Unna admired Dr Lifschütz’s specialist knowledge in this area and presented it to Dr Oscar Troplowitz, the chemist and co-founder of the Beiersdorf company. He immediately recognised that the water-in-oil emulsion was the perfect basis for a cosmetic skin cream. All that they now needed was a name. And to find one, Dr Troplowitz needed to look no further than the cream itself. Once the emulsion was finished, it had a snow-white colour. The name NIVEA derives therefore from the Latin, “nix, nivis”, meaning snow, and the translation of NIVEA is therefore “snow white”. 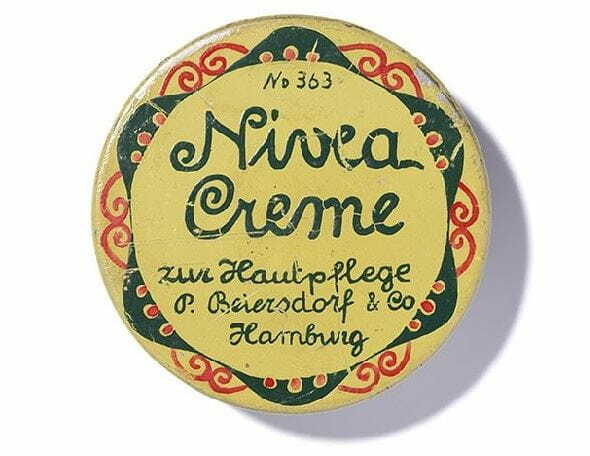 1911 – NIVEA Creme was originally packaged in a yellow tin. It was the first cream that was affordable to all. 1922 – The art nouveau look with the vine decoration is still a long way from the blue that came in later years. 1925 – The premiere for the blue tin with the white NIVEA lettering. 1928 – Since then, the blue tin, its unique fragrance and its velvety texture have remained largely unchanged. 1931 – The ideal of beauty changed into active, healthy-looking skin. This is also reflected in the lettering. 1935 – This year, the modern undecorated font was seen for the first time. 1949 – The introduction of the new NIVEA font still shapes the design of the brand to this day. 1959 – For the first time, the word “Creme” is written in italics, to give the brand more emotion. 1970 – The “blue tin” used to this day was launched on the market. The white circle disappeared completely. 2007 – To this day, the cream in the blue tin is one of the most successful skin care products of all time. Since our company was founded, we have dedicated ourselves to caring for your skin. We develop highly effective products that work in harmony with the skin’s own functions, meaning that your skin gets exactly what it needs. When NIVEA first saw the light of day well over 100 years ago, the entire research activity was done by just three people: Dr Oscar Troplowitz, Prof. Paul Gerson Unna and Dr Isaac Lifschütz. We now employ over 500 members of staff in the area of research and development to unlock the complex processes that take place in the skin and to develop ever new, effective skin care products. Thus, over the decades, we have developed many ground-breaking products such as our skin cream, body lotion, sun cream with SPF, a special men’s range, pump sprays, skin care for mature skin and even anti-ageing products with Q10! And in doing so, it is important to us to always meet the needs and wishes of our customers. By engaging in direct dialogue with them, we have managed to develop products that stand for the best quality and that are trusted implicitly. Our skin research centre in Hamburg is one of the most important research centres in the world. NIVEA Creme comes from Hamburg. Almost 8,000 tins an hour are filled with NIVEA Creme here. What shower gel type are you?